Model T Ford Forum: Steering question. Model T Ford Forum: Forum 2018: Steering question. I'm just about done rebuilding the steering column of my '27 and have a part left over. It appears to be some kind of thrust washer, but it has a slot for a keyway in it. I assume that it goes either inside the steering gear case just below the opening for the steering wheel shaft, or just above the opening between the cover and the steering wheel. The "Bible" doesn't say anything about it. Ideas? No washer with a key way cut in the steering box. Someone may have made it to take up slop between the steering wheel and cover. The only "washer" in the box is the flanged bushing in the cover. 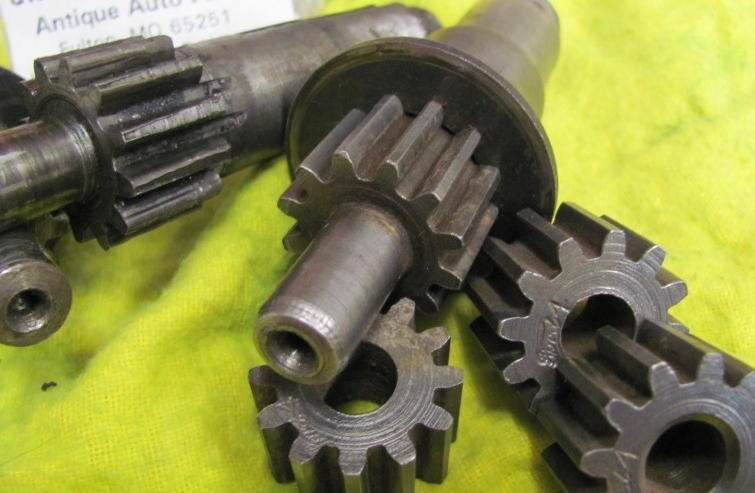 The parts section of the encyclopedia lists #3506-B, steering gear drive pinion washer, but the pictures show it as just a plain round washer with no key way. That p/n 3506B washer sits on the top of drive pinion. The worn out 4:1 drive pinion upper left has washer removed. Pinion on the right has its washer in place. Never could figure why the bushing was pressed on the easy to replace pinion and not in the housing. I never knew about the different 4-1 pinion gears until a week or so ago. I bought a 13-14 column with a bad shaft and the pinion wouldn't fit into a later shaft because it was too long.